Click here to see Judith's video testimonial about RSI and "Hands On Healing". By now you may have heard about at least several famous musicians who have struggled with repetitive strain injury… including the jazz pianist Jimmy Amade, folk/blues guitarist Leo Kottke, noted classical pianists Leon Fleisher and Gary Graffman, to name a few. But many others are hurting - in the shadows. By some published calculations, as few as 50% or as many as 89% of orchestra musicians have suffered, or will suffer, some debilitating condition which will affect their ability to play their instruments, by the time they are done their career. Yet we hardly ever hear about these cases… why is that? The reason is that musicians fear that if "the word gets out" that they are "injured", then no one will ever call them again for a job and their career will be ruined. I was one of those musicians who felt that I could not talk about my condition, for fear that no one would hire me ever again. Now I am happy to say that "I'm coming out of the RSI closet" and as it were, embracing the reality that I have suffered from repetitive strain injury for some 20 years now, and will surely have to manage the condition for the rest of my life. The fact that I have indeed gone through periods - long periods … at one point I could not play the guitar for five years… of inability to play my instrument, but yet have rebounded several times to the point where I can indeed play again to virtually full capacity, is something that I want to share with everyone, especially those of you who may be going through this living hell right now, and feel there is no hope. In addition, I am sick to death of keeping this huge chapter of my life a "secret". In fact, I have an extremely fascinating story to tell, including the incredible fact that, because of RSI, I successfully taught myself to write with my non-dominant left hand - something which most people, and certainly I, never could have imagined possible, before!! I met and worked with many dedicated healers along the way, and above all, learned that, no matter what negative thoughts one might have, it matters not… because the body wants to heal, and with a little encouragement and a lot of diligence, it will heal! Now, the following is a version of my video talk on my RSI condition. Please read what I have to say below. Eventually, there will be a link to the video, where you'll even see me play a little tune, using my all-important guitar stand! Meanwhile, also please open up the PDF file called "Living with RSI during the Acute Stage - Crucial Tips for Survival", for more detailed information and advice. My name is Judith Kay. I'm a professional singer/guitarist and composer of jazz-style music. 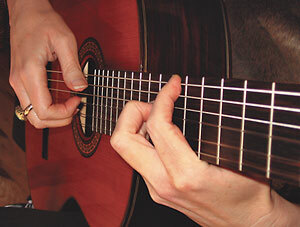 I also teach guitar and voice lessons at my studio in Arden, DE. You may have wondered why you see me out performing for a while, then you don't hear of me for long stretches of time. Here is the reason: I have been dealing with repetitive strain injury for the better part of 20 years. When I was first hit hard with this condition in 1992, I was totally confused by what was happening to me. I just knew that, suddenly, to do almost anything with my hands put me in excruciating pain. Almost in a daze, I went from doctor to therapist to doctor, getting little or no help and sometimes very bad recommendations about what to do. I am forever indebted to two very dear friends, Baltimore-area physical therapists Marilyn Jolly and Joanne Crowell, who donated enormous amounts of time to help analyze my posture and put me on the right road to some initial recovery. In the mid-90s I additionally sought help from the (at that time) well-known RSI guru, Dr. Emil Pascarelli, who added crucial healing pieces to my puzzle. In 2003 when I suffered a serious reinjury, Dr. Pascarelli, who had retired from his New York practice, referred me to Ms. Suparna Damany, whom he described as a physical therapist in Allentown, Pennsylvania who was doing "cutting-edge" work with victims of RSI. The chronic nerve damage which I have sustained in my right arm, when flared up, mimics the horrific symptoms of reflex sympathetic dystrophy, a condition which, when mentioned, will make most doctors visibly shudder. I had electric shock type pain up my arm when just touching something lightly, or would feel an eerily strange buzzing sensation. My pain level escalated often to a horrifying level 9 or 10, and stayed there. I could not open a drawer or a door, and I could barely comb my hair or brush my own teeth, and was certainly unable to prepare my own food. After numerous phone calls to so-called "experts" who all basically told me that I was doomed to a life of disability and living on pain killers, my conversation with Ms. Damany was the first one to give me hope. She reminded me that I had gotten out of the symptoms before, and that she would help me get out of them again. She spoke in a matter of fact tone of voice with no angst, and encouraged me to schedule an appointment with her as soon as possible. The general philosophy at Hands-on Healing is that you cannot stretch nor strengthen damaged tissue. The deep tissue massage that is the hallmark of the successful treatment there, which is carefully administered by Ms. Damany and her staff of well-trained physical therapists, actually breaks up tissue which is stuck together, releases toxins and allows the muscles and tendons to get back to square one, to a place where you can then safely begin a diligent stretching and strengthening program. In just two months time of regular visits, my pain level was significantly decreased and I was well on the road to recovery. A few months after that I was back to driving and performing most activities of daily living without pain. A short time after that I began playing the guitar again. Of course there was an important daily regimen of exercises that got me to this place. There is an artistic, even creative, approach at Hands-on Healing, instead of a cookie-cutter style, typical of the physical therapy "mills" that are so prevalent in the U.S. I have found the improvisatory style at "The Last Resort" (my affectionate nickname for this place) to be extremely compatible with my own artistic nature, as a musician. First of all, never NEVER ignore symptoms of RSI, this is a serious condition and if not attended to quickly can get significantly worse! Pay attention and get help right away. Your lifestyle will change while you are in the healing process; your activities will be drastically curtailed; ACCEPT THIS AS BEST AS YOU CAN. IF YOU FIGHT THIS, YOU WILL NOT GET BETTER. Focus on what you CAN do, not on what you can't. Get physical assistance at home, whether it be from a spouse, family member, friend or neighbor; if necessary, pay a teenager down the street to come over regularly and do chores for you. (I did that). Be prepared to ask for help in public, and do not be ashamed about it. People are amazingly willing and anxious to help you (w/ lifting items, opening doors, etc.). Focus on what you CAN do, not on what you can't! NO LIFTING, SQUEEZING, TYPING, ETC. ETC. DON'T TRY TO PROVE ANYTHING! I once thought I would never play the guitar again. In fact I told everyone that was the case! However, with the help of the caring staff at Hands-on Healing I have gotten my strength back in my arms and am able to do once again what I love most – playing the guitar. You can get better and you WILL get better. Visit Hands on Healing in Allentown, Pennsylvania and see for yourself. Click here to visit the Hands On Healing website. Copyright 2003-2016 by Judith Kay. Contact us!